The ancient kingdom of northern Greece was called Macedonia. This powerful empire was ruled by Alexander’s father, King Philip II. In 356 BCE, in the Pella region of Macedonia, King Philip’s wife Queen Olympia gave birth to a son and named him Alexander. 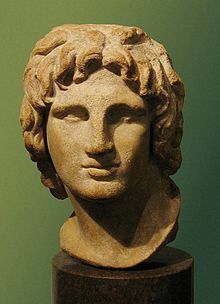 Eventually Alexander would be known as Alexander the Great. King Philip’s military campaigns meant that he was away from his family for extended periods of time. Alexander resented the fact that he rarely saw his father. Young Alexander and his sister were raised in the royal court by their mother who was a strong role model. Leonidas was one of Alexander’s first tutors. Hired by King Philip to teach the dark-eyed, curly-haired boy mathematics, archery, and horsemanship, Leonidas had trouble keeping control over his unruly student. The next tutor King Philip hired to teach Alexander was a man by the name of Lysimachus. He tried to get Alexander’s attention with role playing. Alexander’s interest in all things military became clear during these lessons as he pretended to be the great warrior Achilles. In 343 BCE, when Alexander was thirteen years old, his father hired the famous philosopher Aristotle to tutor him at the Temple of the Nymphs at Meiza. Aristotle was a master teacher and in his classes Alexander and his friends learned about science and politics. Aristotle also taught them drama, literature, poetry, and, of course, philosophy. Alexander loved Homer’s Iliad, the 15,000 line Greek epic poem, set during the Trojan War. Aristotle created a shorter version of the Iliad for Alexander to carry with him during his military campaigns. At the age of sixteen Alexander completed his education and became a soldier. His first military campaign was against the Thracians, a group of Indo-European tribes who had been allies of the Trojans when they fought against the Greeks. In 338 BCE, Alexander helped his father in an important battle to defeat the Athenian and Theban armies. Once Alexander’s father had succeeded in uniting all the Greek city-states with the exception of Sparta into the Corinthian league, Philip’s relationship with Alexander came apart. He banished Olympia and Alexander and married Cleopatra Eurydice*. During the festival following the wedding of Alexander’s sister, King Philip was murdered by a Macedonian noble. Many people suspected that Alexander and his mother had plotted to have Philip killed, but no one knew for certain. Only nineteen years old at the time, Alexander quickly obtained the support of the army. To ensure that her son would be ruler, Olympia had the daughter of King Philip and Cleopatra Eurydice murdered, which drove her mother to suicide. Even though Alexander was now king, he wasn’t put in control of the Corinthian league of Greek city-states. Now that Philip was dead, the states were divided once again. 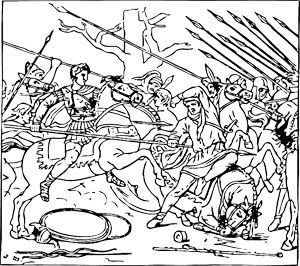 However, Alexander sent his army south to the region of Thessaly and gained their support for his leadership. At a meeting of the members of the league, Alexander worked for their support and received it. With the exception of Athens, the other Greek city-states granted him full military power. After making sure that Macedonia’s northern borders were secure, Alexander prepared to do battle with the Persian Empire, a large kingdom to the east of Greece. But before his conquest of the Persian Empire could occur, Alexander got news that the Greek city-state of Thebes had forced out his Macedonian troops. He was concerned that there would be a revolt of the Greek city-states, so he marched his huge army of over 3000 cavalry soldiers and some 30,000 infantry soldiers to the tip of the Greek peninsula. He destroyed Thebes and this caused fear among the city-states. Even Athens pledged their loyalty to him. At the age of 22, in 334 BCE, he left for his Asiatic campaign. He and his armies faced and quickly defeated Persian King Darius III’s army near the Grancius River. They rested for the winter at the southern coast of Asia Minor. Ready for battle once again, they defeated the Persian troops in the summer of 333 BCE. Even though Alexander’s troops were outnumbered, he created formations and strategies that defeated the Persians. In November he captured King Darius and declared himself the King of Persia. Next it was Alexander’s goal to conquer Egypt. He easily achieved this goal and in 331 he created the city of Alexandria, named after him, of course, which became an important Greek cultural and commerce center. Later that year, he defeated the Persians again at the Battle of Gaugamela. Now Alexander was “King of Babylon and Asia.” He was, in effect, King of the four quarters of the known world. Next he set his sights on eastern Iran, where he formed colonies under Macedonian rule. After capturing Iranian Prince Oxyartes, he married the prince’s daughter, Rhoxana. India was next in 328 BCE. He defeated King Porus’ armies in the north of India. He was impressed by Porus so he gave Porus back his rule and won his loyalty. Alexander marched eastward to the Ganges river but his troops were weary. They missed their wives and children and wanted to go back to Macedonia. Alexander was wounded by Malli soldiers as they traveled back along the Indus river. He recovered and then he and his armies headed north along the Persian Gulf. Many of them died or became ill. In 324 BCE they reached the city of Susa, now in Iran. In order to unify Persia and Macedonia, he commanded that Macedonians marry princesses from Persia. He recruited thousands of Persian soldiers and dismissed Macedonian soldiers. This made his loyal soldiers very angry. He tried to appease them by killing 13 Persian military leaders. At the age of 32, Alexander became ill and died in Babylon, Persia, now part of Iraq, while he was planning the conquests of Carthage and Rome. He might have died of malaria, but many historians believe he might have been poisoned. His wife gave birth to his son a few months later. Alexander’s empire collapsed after his death but over time the cultures of Greece and the Orient blended and thrived due to Alexander’s empire. BCE stands for Before Christ or Before the Common Era. Remember in this numbering system the year 334 comes after the year 356 by 22 years. Cleopatra Eurydice was not the same famous Cleopatra from Egypt.